August 6th, 2011 ~ our final going-away gathering at 8447. Mom was in the final throes of packing, but that didn't stop us from eating, laughing, combing the garage for treasures, and saying goodbye to The Oak. Greg, Max and Peter undertook an exploration of the Crypt Under the Kitchen, and discovered...car parts. 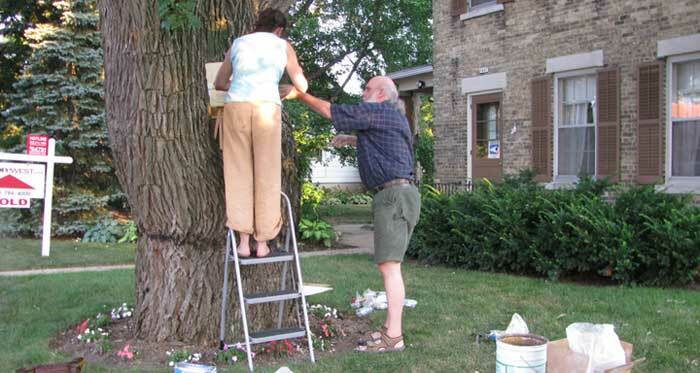 At Mary's suggestion, Bill/Lou and Day decided to attempt making a mold of part of the bark of The Oak. This was a special part, a place where a long-ago limb had been removed. When we were young, the partly-healed roundrel was a tiny secret door into the heart of the trunk. Now decades later the spot has completely grown over in a smooth curve that is nevertheless still distinctive and evocative. Mawkish video paean to 8447, with voiceover tales by Mom. Backround tune is "Going Home" played on smallpipes and tamboura by Bill/Lou and Day.